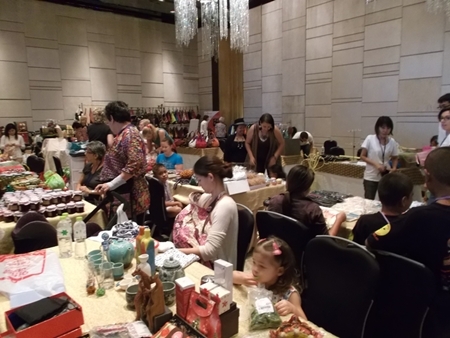 The Pattaya International Ladies Club (PILC) held one of its most successful Christmas Bazaars at the Hilton Hotel in Pattaya on Saturday, November 3. Deputy Mayor Ronakit Ekasingh opened the event. 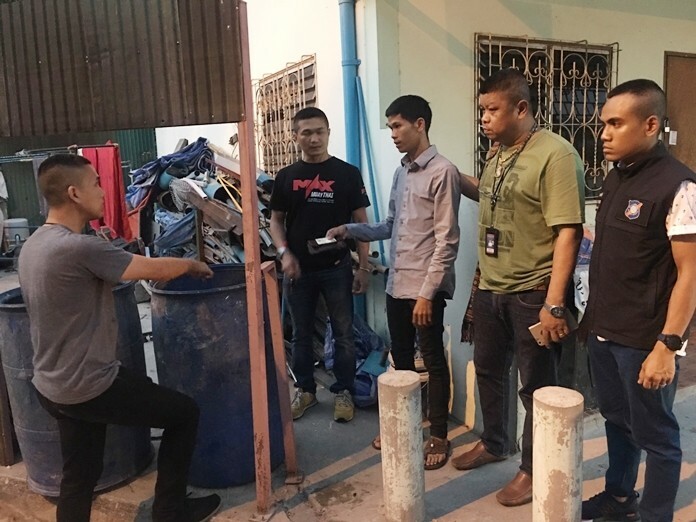 “We are fortunate in Pattaya to have an organization like PILC,” Ronakit said. 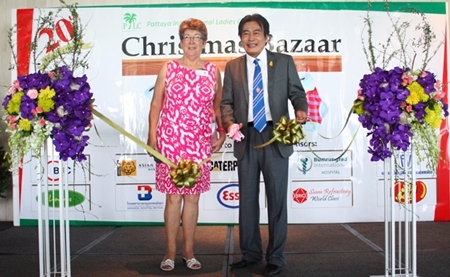 The Christmas Bazaar, which has become a signal for the opening of the Christmas shopping season here in Pattaya, featured 80 vendors from all over Thailand, many of whom do not sell their wares in mainstream shops, thus giving buyers a chance to find goods that are not available elsewhere. 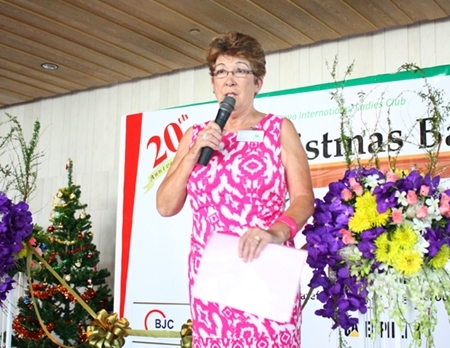 PILC President Ann Winfield welcomes guests to this year’s Christmas Bazaar. 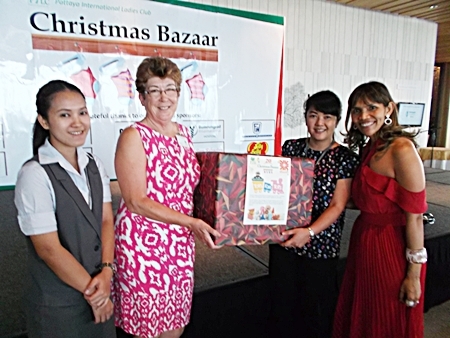 PILC uses the bazaar to raise funds that allows the club to support numerous charities in the Pattaya area. 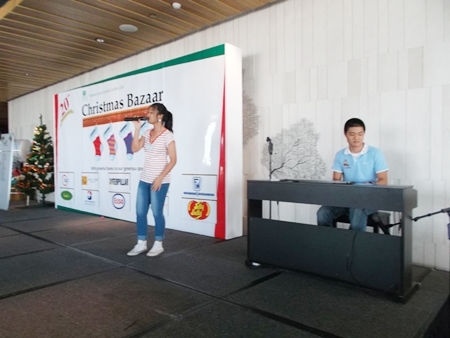 This year, the Club added an activities component to the bazaar to entertain those people who wanted a break from shopping. A children’s activity area provided a coloring competition for three age groups, a face painting station, and a wonderful Santa’s Grotto, complete with a post box where children could post their Christmas toy wish lists. The Fountain of Life had a foot massage area and were kept busy all day with weary shoppers getting a little foot relief. Deputy Mayor Ronakit Ekasingh cuts the ribbon to officially open the event. Mr. Penguin entertained everyone with his magic tricks; a fashion show highlighted beautiful hand-made clothing designed by Finestra, one of the bazaar’s vendors; three dance exhibits from students at local dance studios, and Mr. Jimmy Sinatra made an appearance to entertain the audience as well. 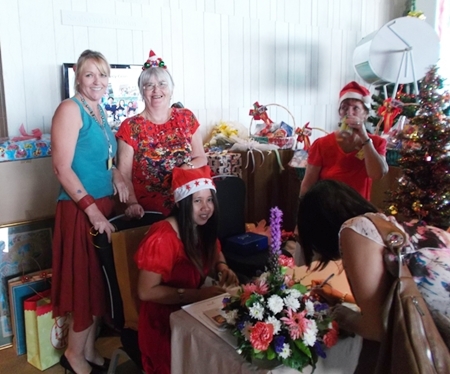 As well as the commercial vendors, some of the charities supported by PILC also had tables. 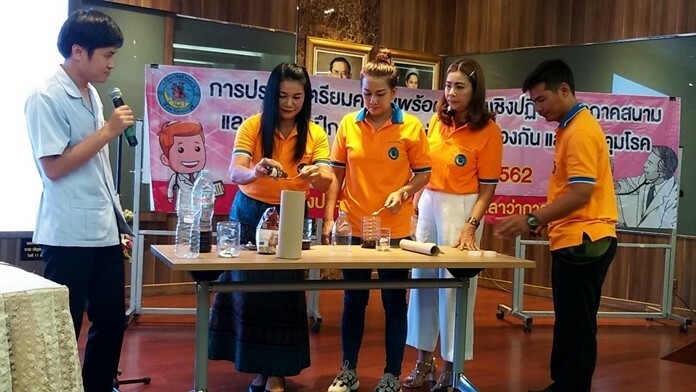 These included Ban Jing Jai Children’s Home, Dek Dee Early Learning Centre, Phu Luang “Our Home” quilters, North Star Library, the Mercy Center, Fountain of Life, and many more. 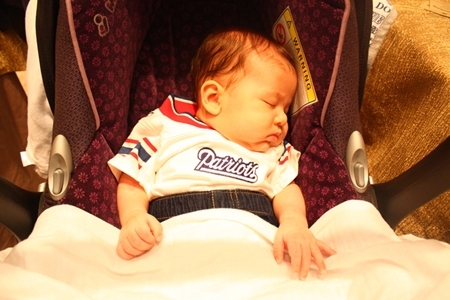 A future Patriots’ fan rests up during the busy proceedings. Central Festival also participated in the bazaar this year: they asked people who attended to bring along a used toy to donate to PILC’s charities. In return, each donor received a THB 100 voucher to spend in the store. The toys will now be distributed as Christmas gifts to the children in the many projects that PILC supports. 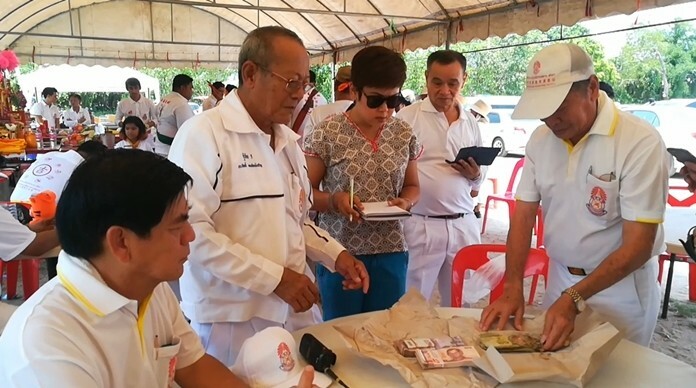 A Central Festival spokesperson said that the store had collected hundreds of toys, and had given out over 20,000 baht in vouchers. 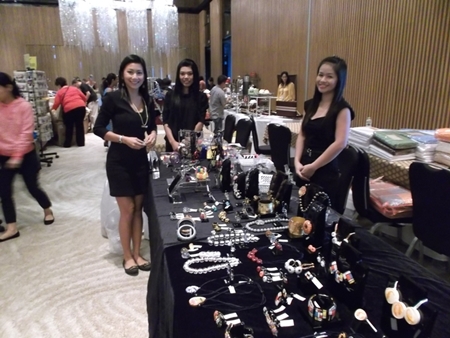 Jewelry vendors display their beautiful wares. 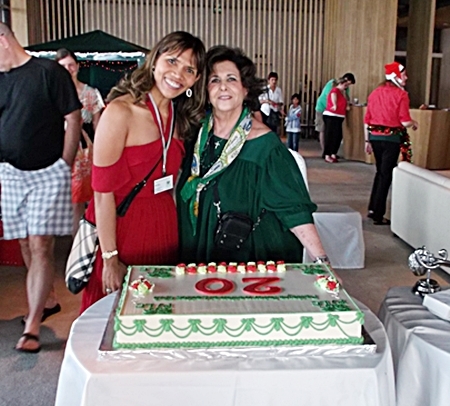 At the end of the day, just prior to the event’s closing, Arlette Cyckman, long-time Pattaya resident and founding member of PILC participated in a cake cutting ceremony to celebrate the 20th Anniversary. The cake was then distributed amongst all of the attendees, volunteers, and staff. 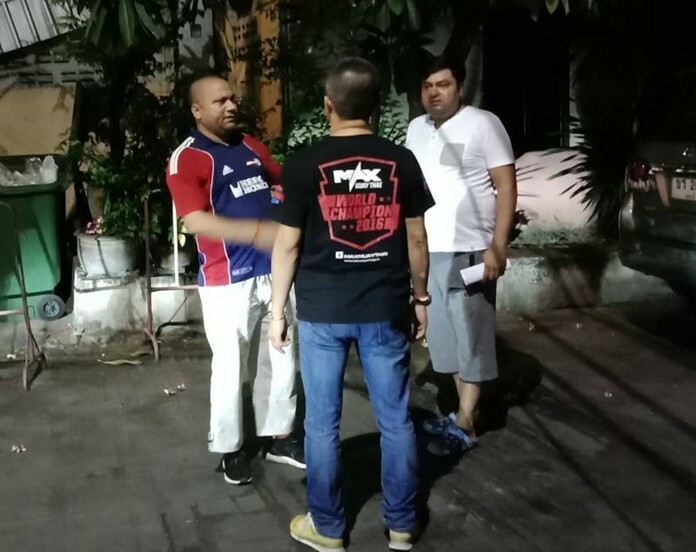 Many people were not able to stay for all of the raffle number draws, but you can find all of the raffle winners on the PILC website at www.pilc-pattaya.com and printed in the Pattaya Mail. If you find you have won a prize, please email [email protected] for details on how to collect your prize. All prizes must be collected by November 30, 2012. Cheerful PILC members at the raffle table. 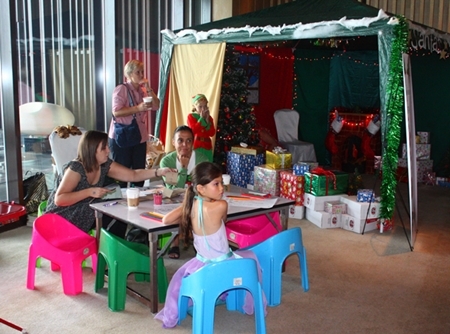 The children’s activity area included a wonderful Santa’s Grotto. Long-time PILC member Arlette Cykman with Special Events Chair Ananya Welland. (L to R) Lewis “Woody” Underwood, Sister Ganyanee and Sister Joan Gormley from the Fountain of Life take a refreshment break. Music students from St. Andrews International School entertain the audience. 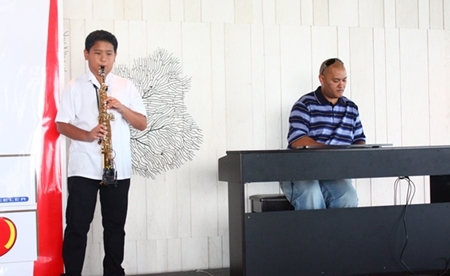 This youngster gives an amazing alto saxophone performance. 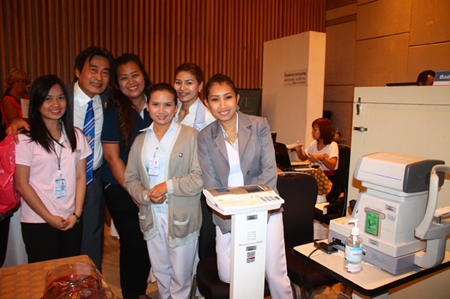 Helpful staff from Bangkok Hospital Pattaya are on hand to give free eyes and ears checks. 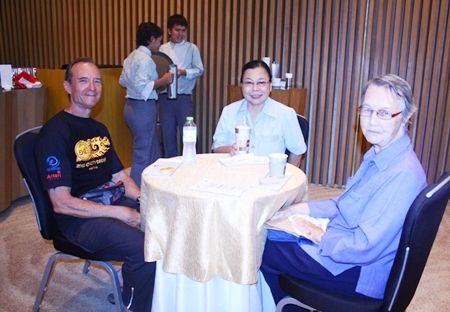 (L to R) Sunday, Simon and Aum help ensure the success of the Christmas Bazaar at the Hilton Hotel, Pattaya. 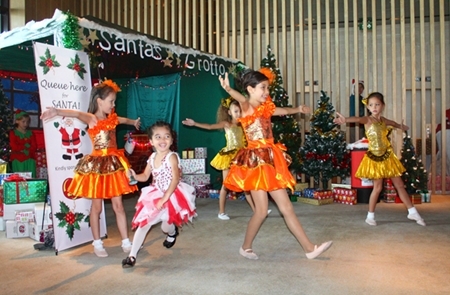 Young angels perform in front of Santa’s Grotto. 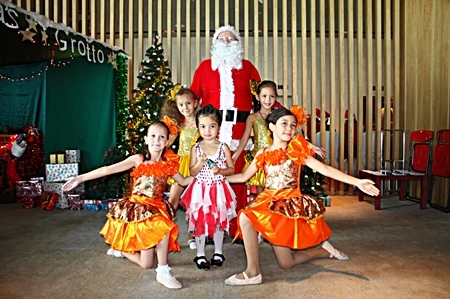 Santa surrounded by little dancers. 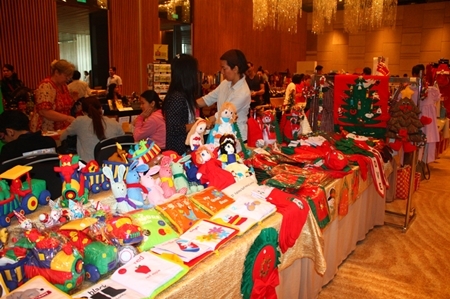 80 vendors attended the PILC Annual Bazaar to sell their products. 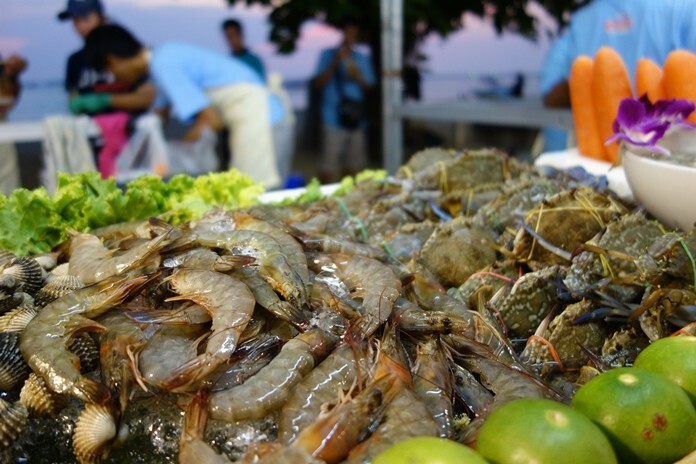 The Christmas Bazaar, which signals the opening of the Christmas shopping season here in Pattaya, features 80 vendors from all over Thailand.